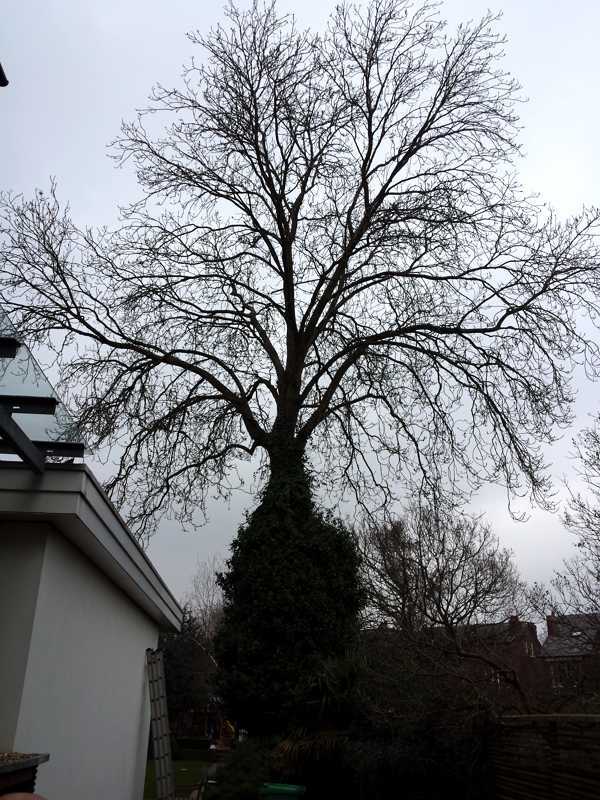 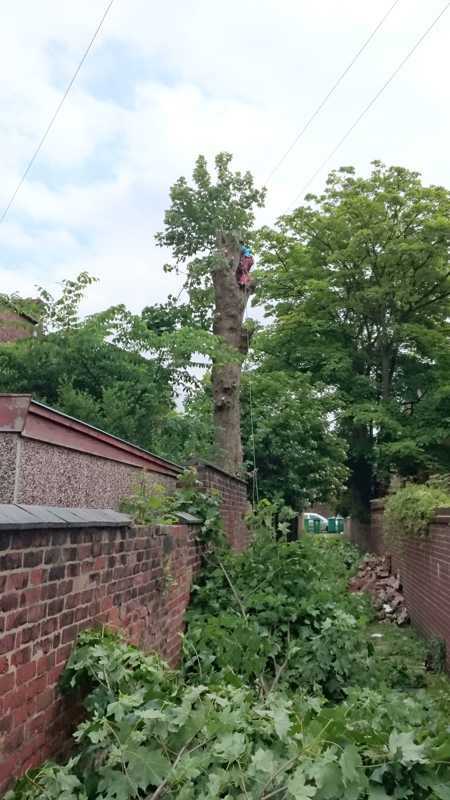 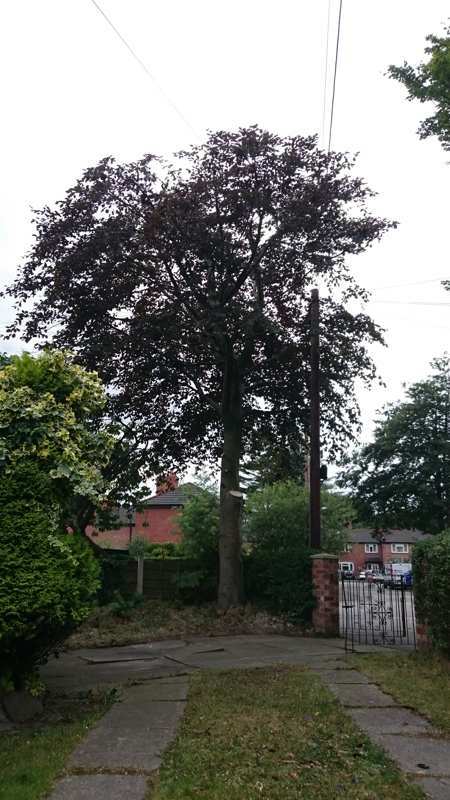 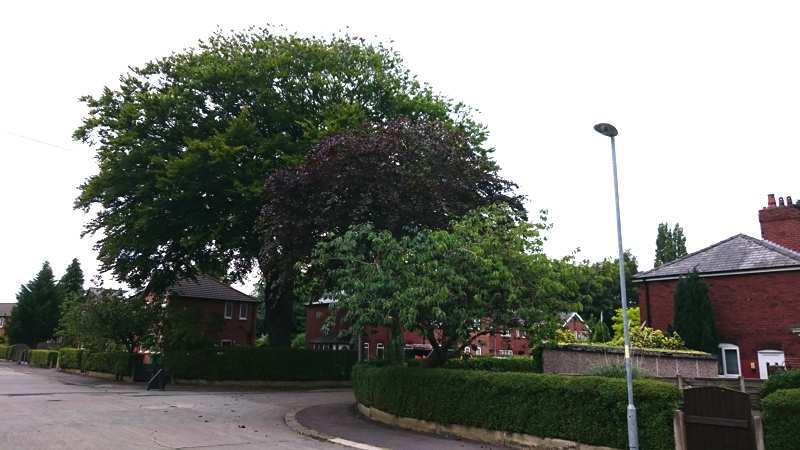 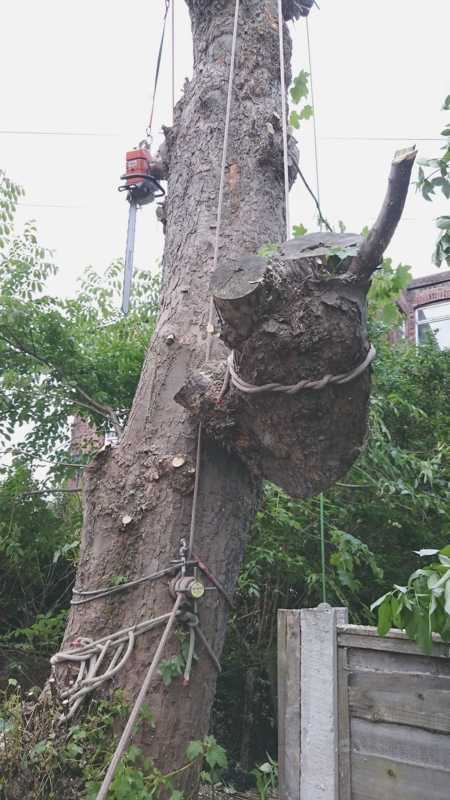 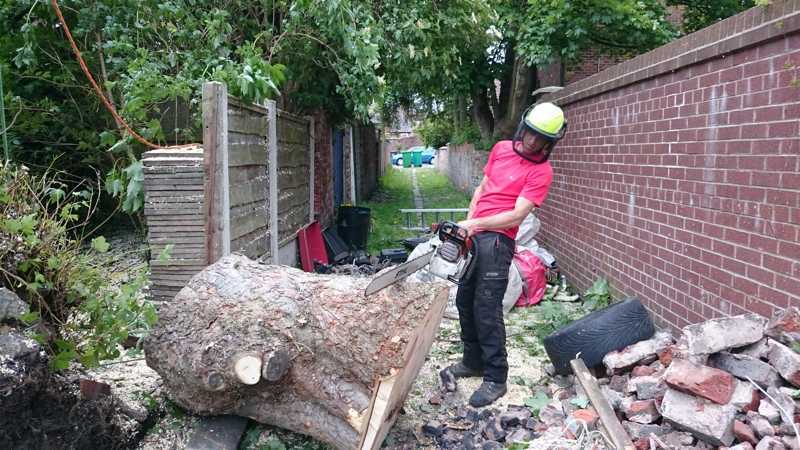 This massive sycamore tree growing in a back yard of a Levenshulme terrace had been previously pollarded, leaving just a trunk. 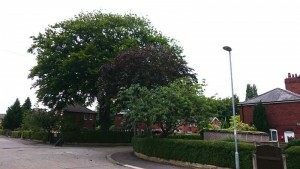 This had grown back into a thick canopy and the tree was continuing to knock over the back wall with it’s annual growth. It was time to get it removed to prevent any further damage to the wall. The unstable wall was taken down by a builder then we came in to do the removal. 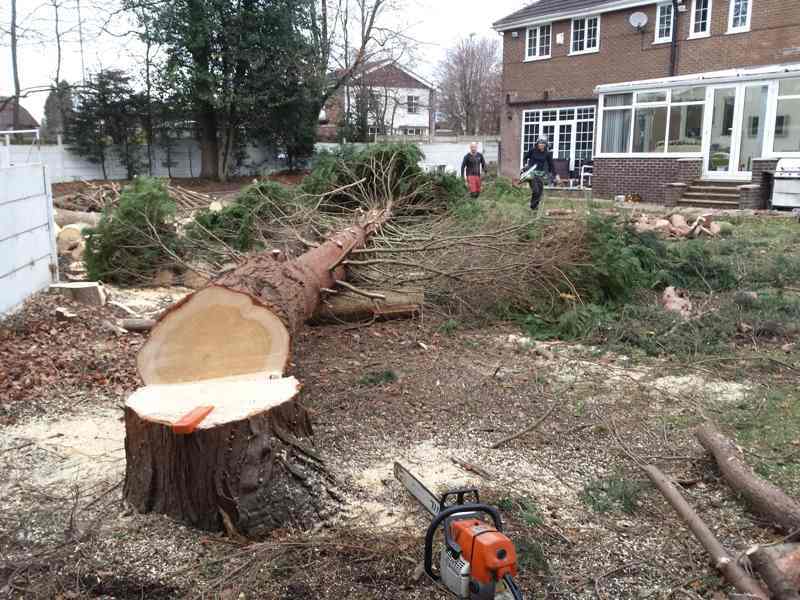 We had the stump ground out the following day so the so the wall could then be rebuilt with minimal disruption to the client. Removing the last of the re-growth from the massive trunk. 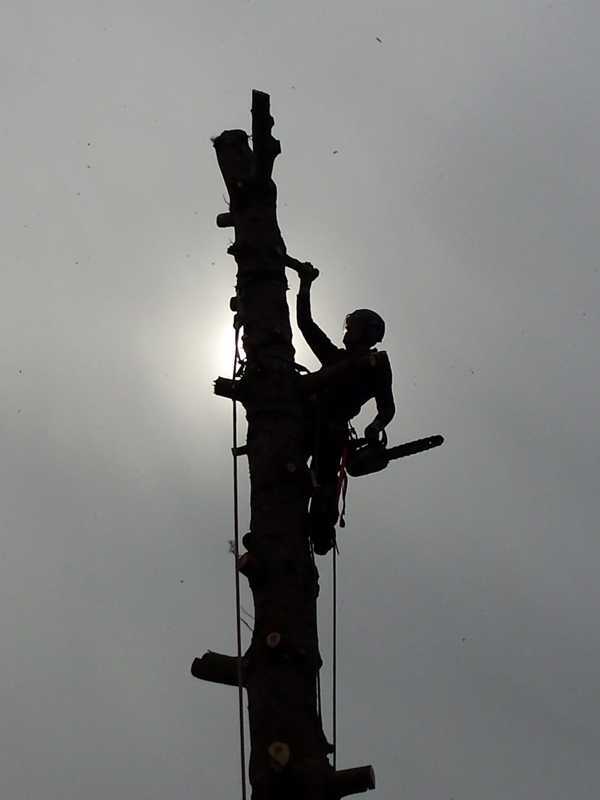 Cutting up a section of the tree into manageable pieces. Sections of the trunk ready to be cut up for firewood. 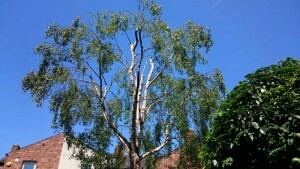 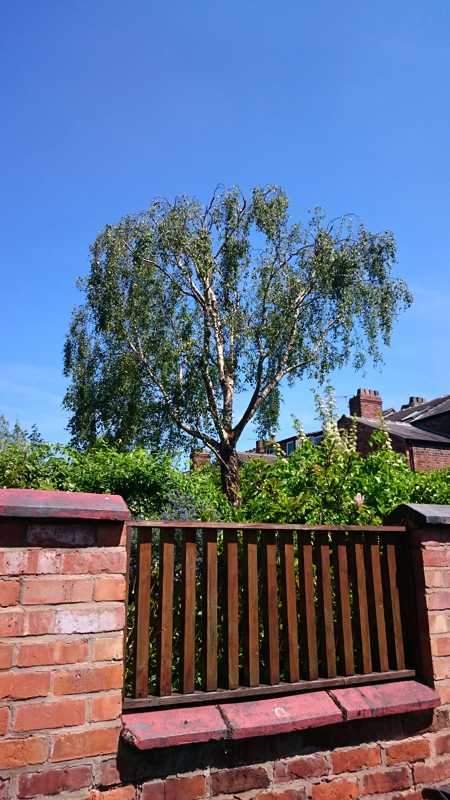 This large birch tree at the end of a small back garden in Chorlton and a neighbouring rowan tree were blocking out a lot of the available light, This was preventing the residents from being able to grow a lawn for their kids to play on. 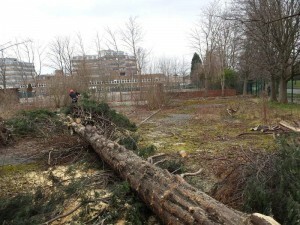 We removed the rowan. 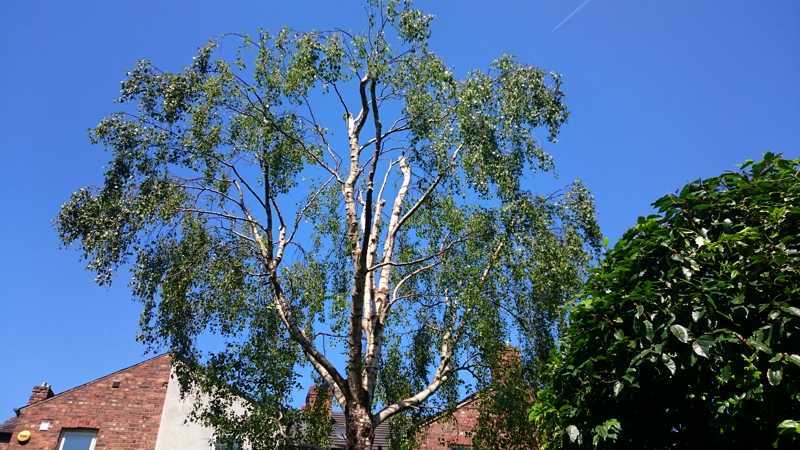 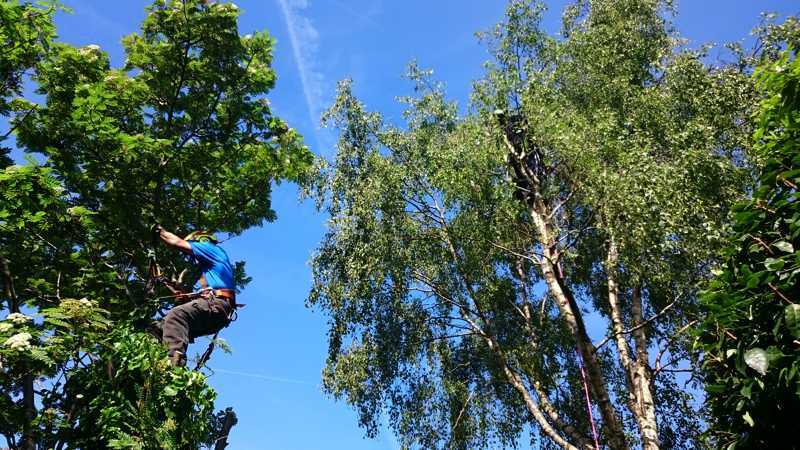 We removed the ivy growing up into the crown of the birch and gave it an overall crown reduction, as well as thinning it out to allow more light to penetrate into the garden. The customers were very happy with the results. 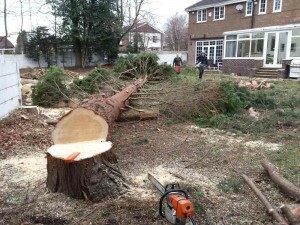 They were looking forwards to sowing a new lawn and sorting out the garden now that it wasn’t so overshadowed. 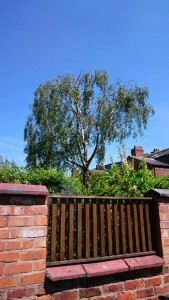 This large ash tree in a back garden in Chorlton was looming over the back decking area and blocking out a lot of light to the garden. We removed and reduced several of the lower branches and removed the ivy down to around eight feet to maintain a bit of a screen from the neighbouring garden. 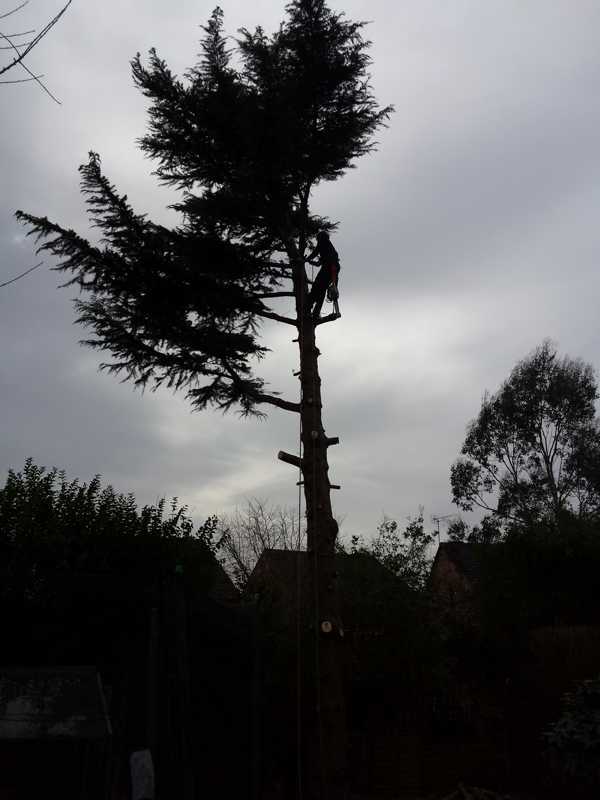 This allowed a lot more light into the garden and house, and pigeons no longer had a perch above the decking to do what they do. 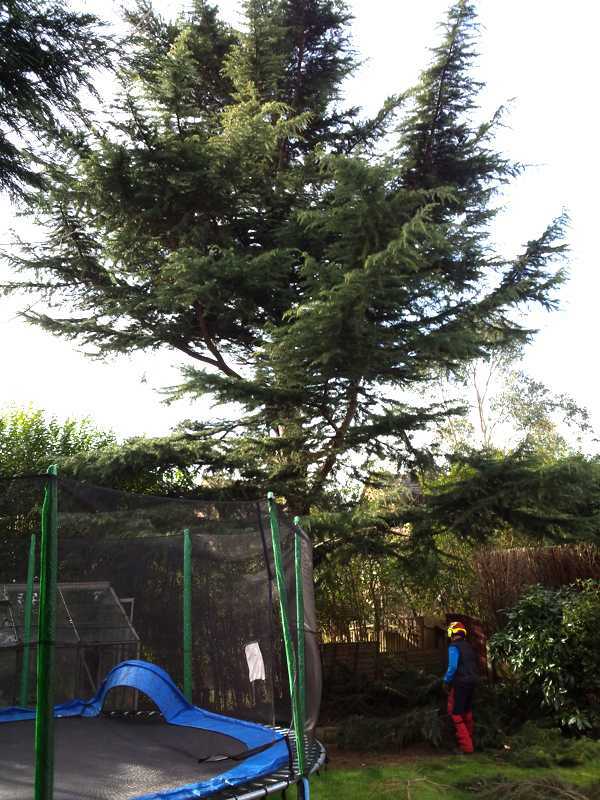 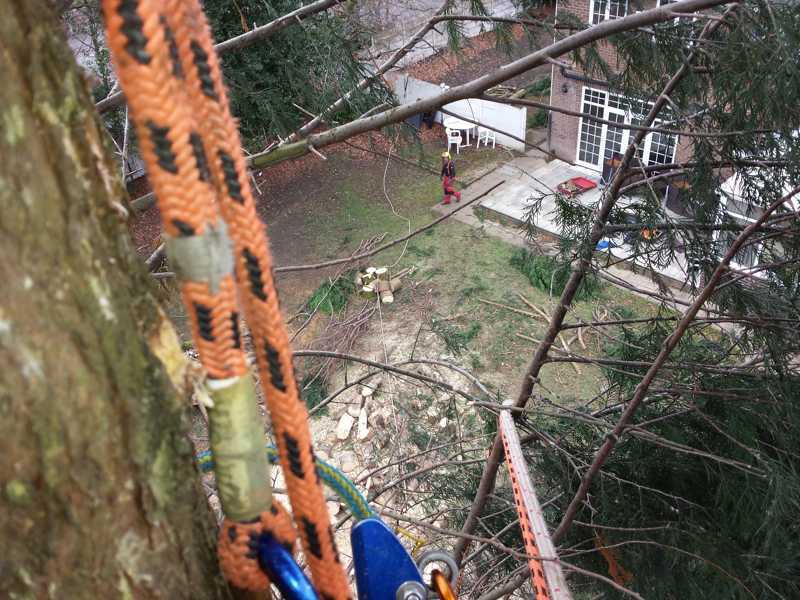 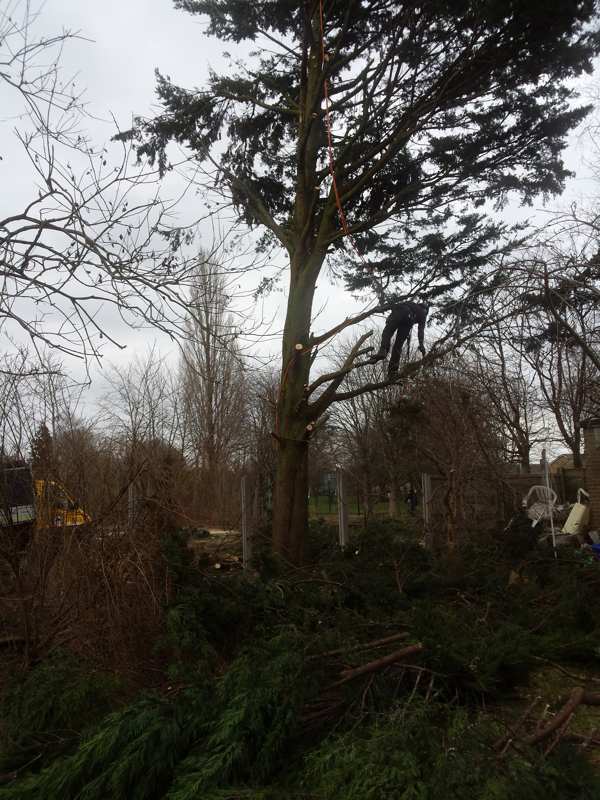 This large cedar tree had started to worry the occupants of the house by shedding several large branches during the winter months. Their heavy horizontal branches are prone to breaking with the extra weight of a covering of snow. It was time to remove it before it caused any damage or injuries. 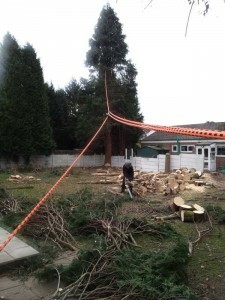 A bungalow in Wilmslow was completely overshadowed by a line of very tall conifers in this garden. 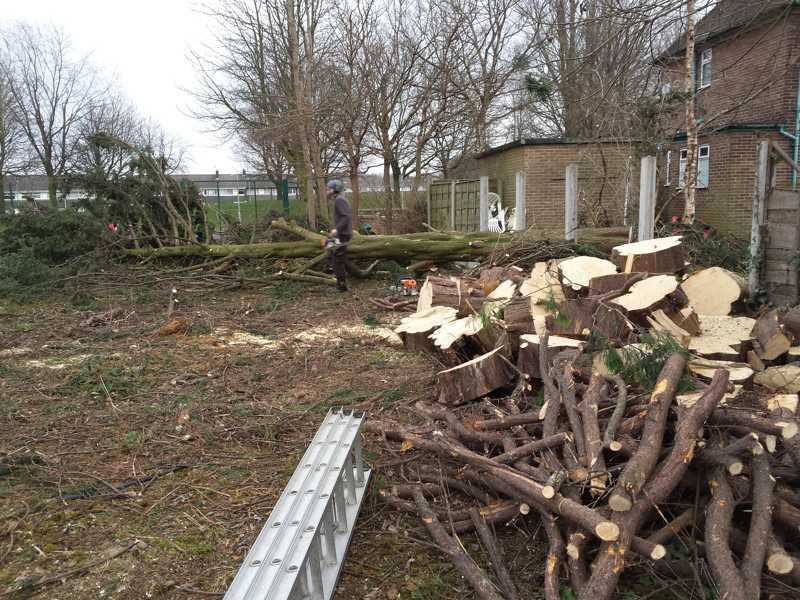 The large garden meant we could fell some pretty big sections after removing a lot of the branches from the bungalow side. 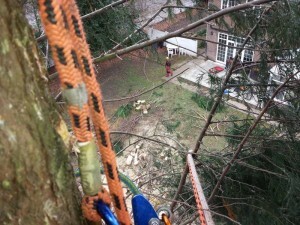 View from up one of the trees. 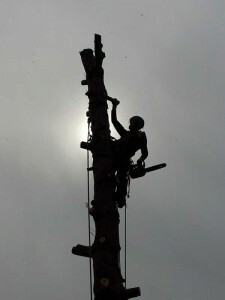 Rigging up a pull line to help fell against the wind. 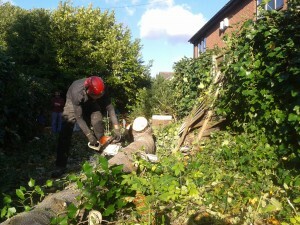 Felled onto logs to make the cross cutting easier and protect the lawn. A lot of the logs went to a local garden centre to be processed into firewood. 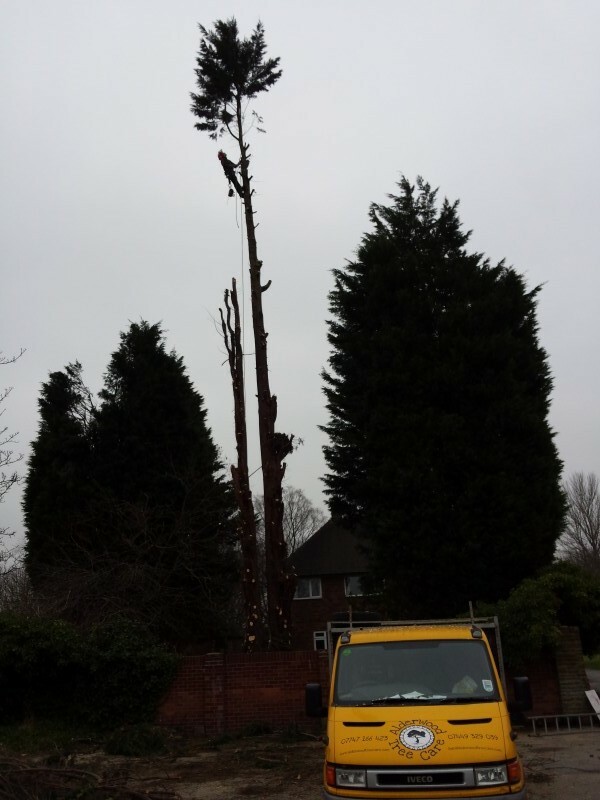 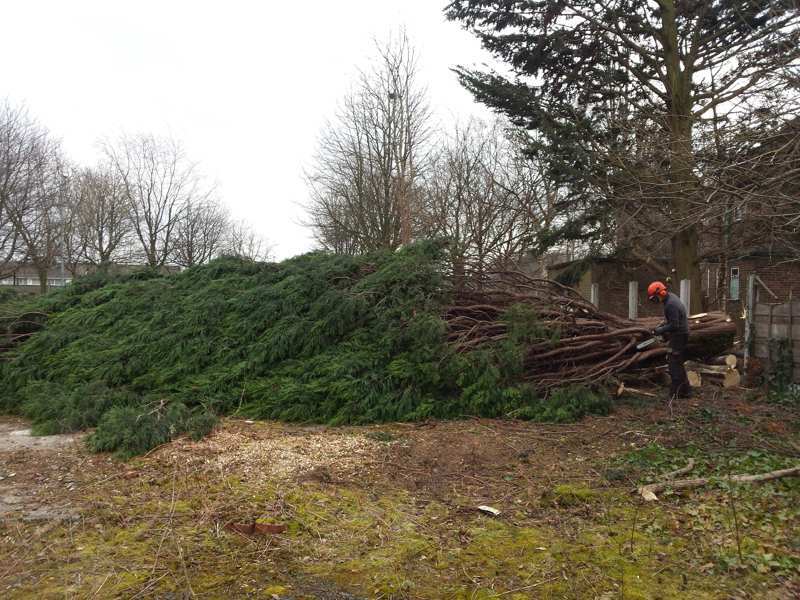 These large conifer trees were surrounding a house in Wythenshawe and almost completely blocking any natural light getting to the property and garden. 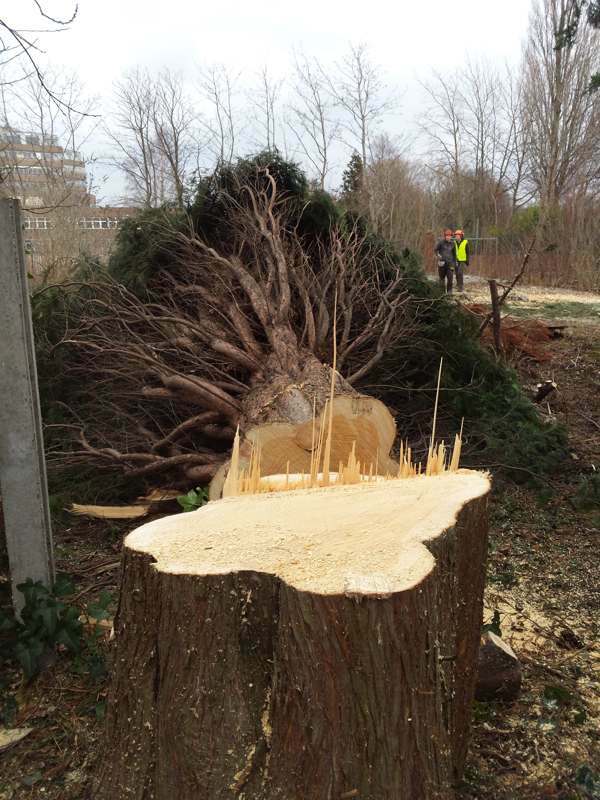 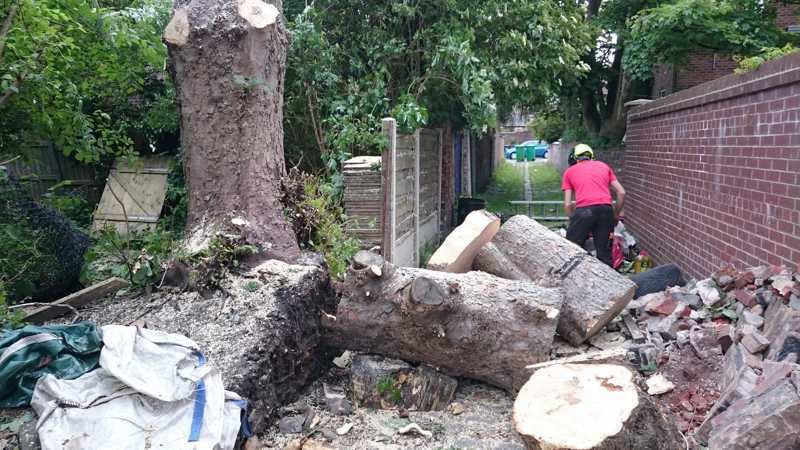 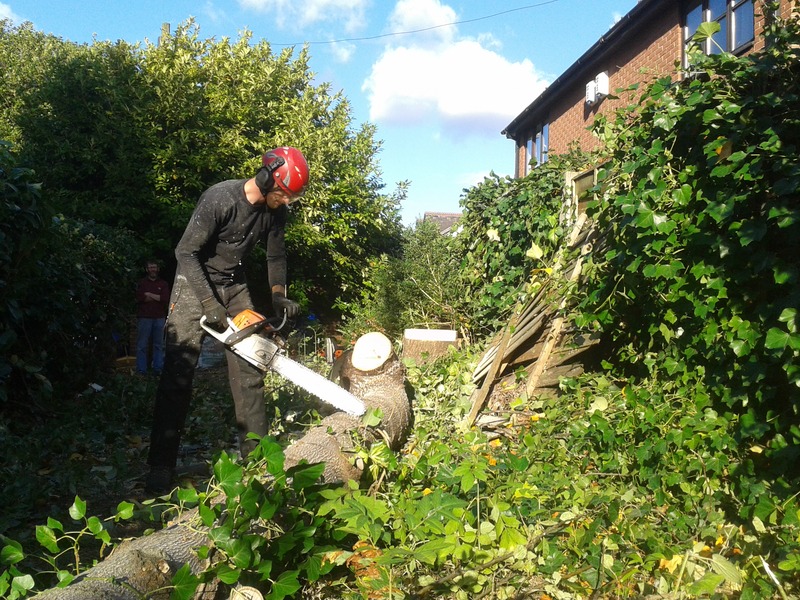 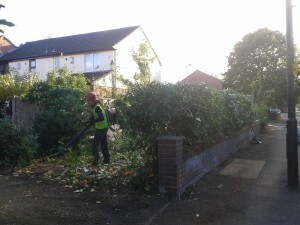 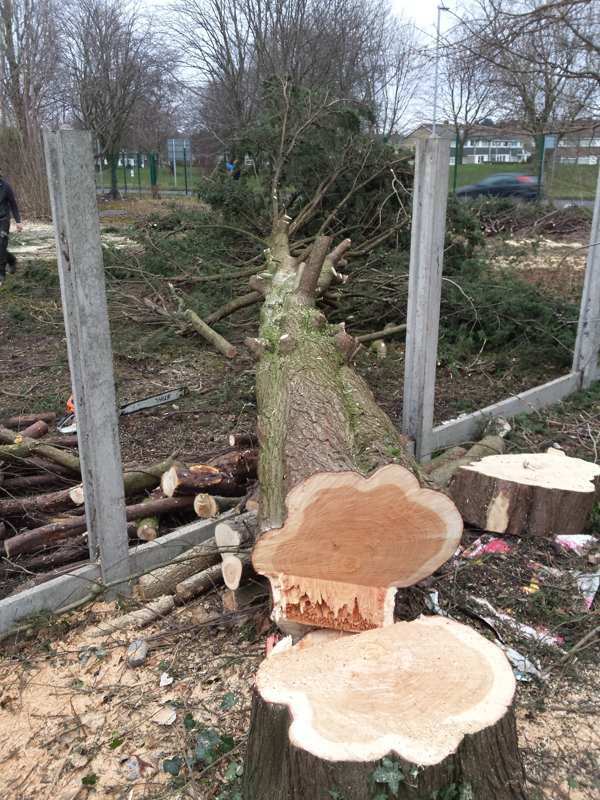 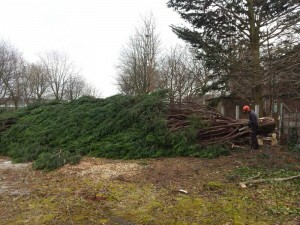 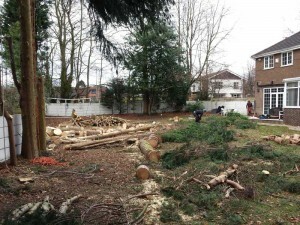 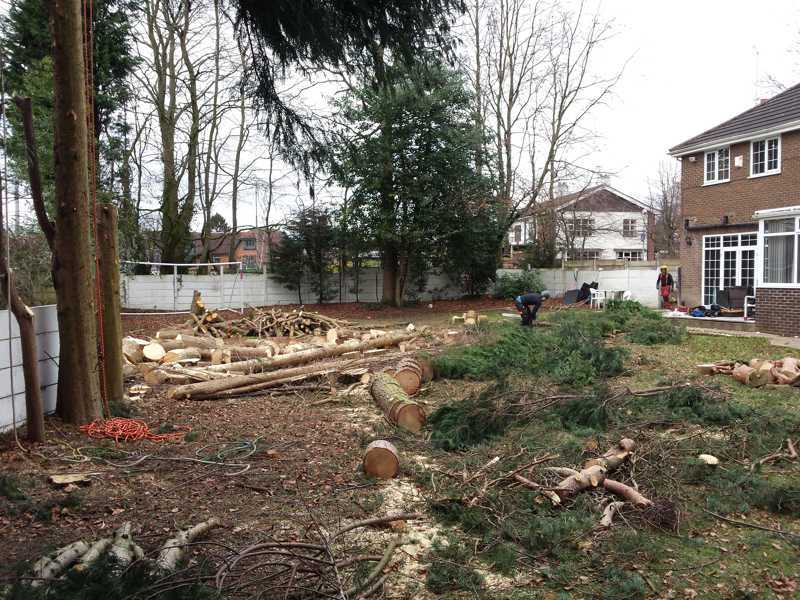 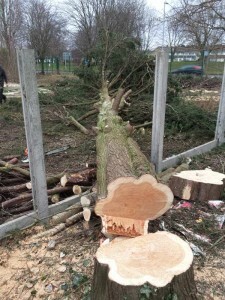 Some could be felled into a neighbouring wasteground where they were processed and removed. This larch stump was in the way of a newly created play area. 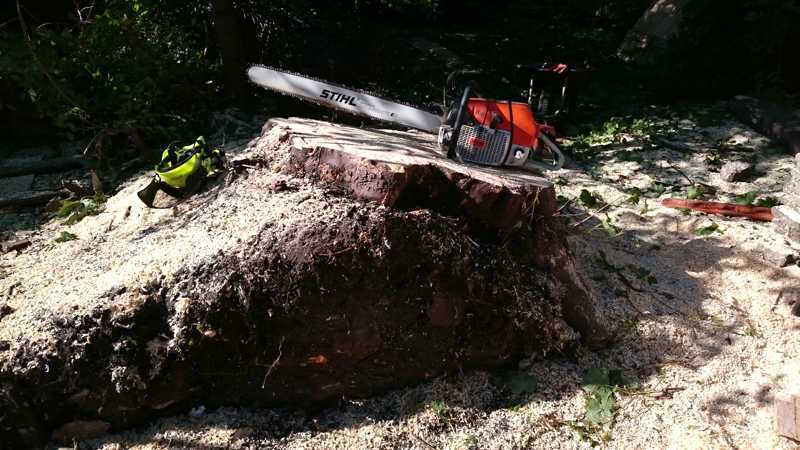 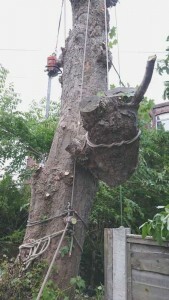 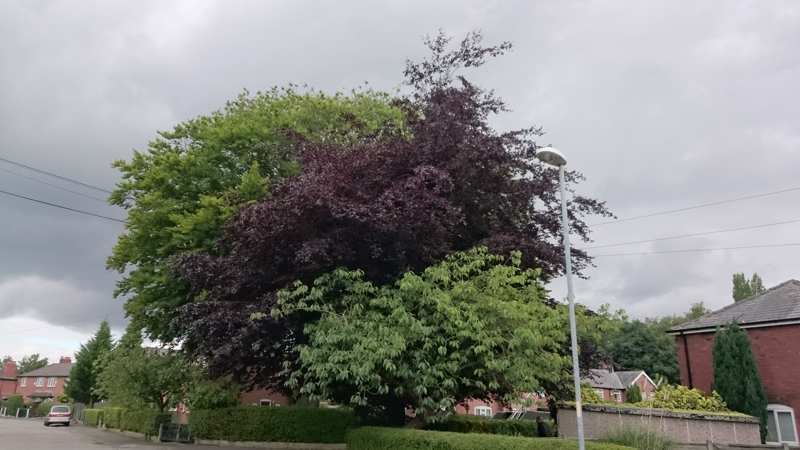 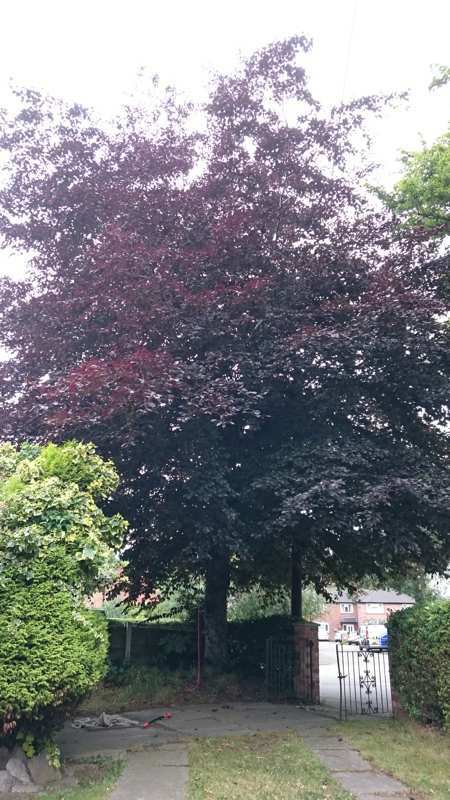 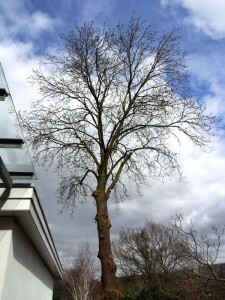 It needed to be removed without damaging the roots of a nearby cherry tree. 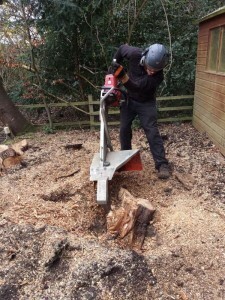 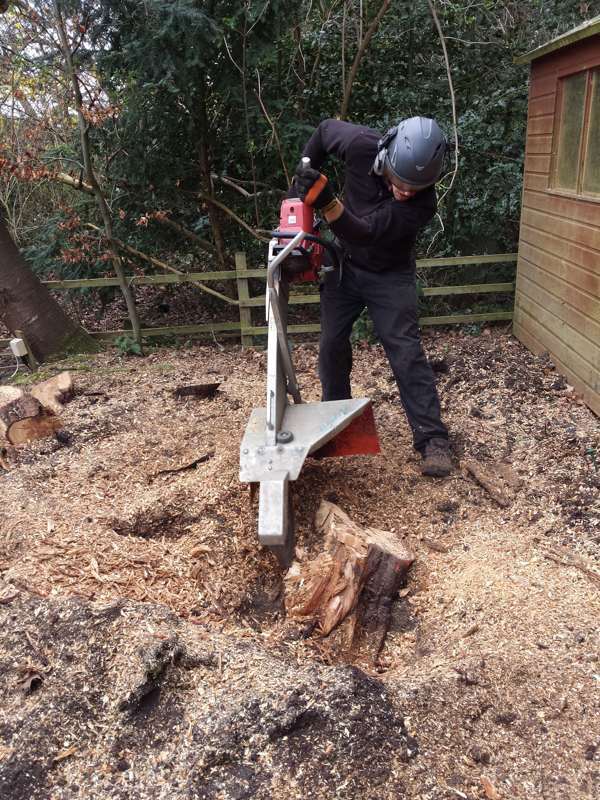 Grinding out the stump using the Alpine Magnum. 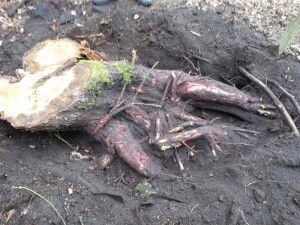 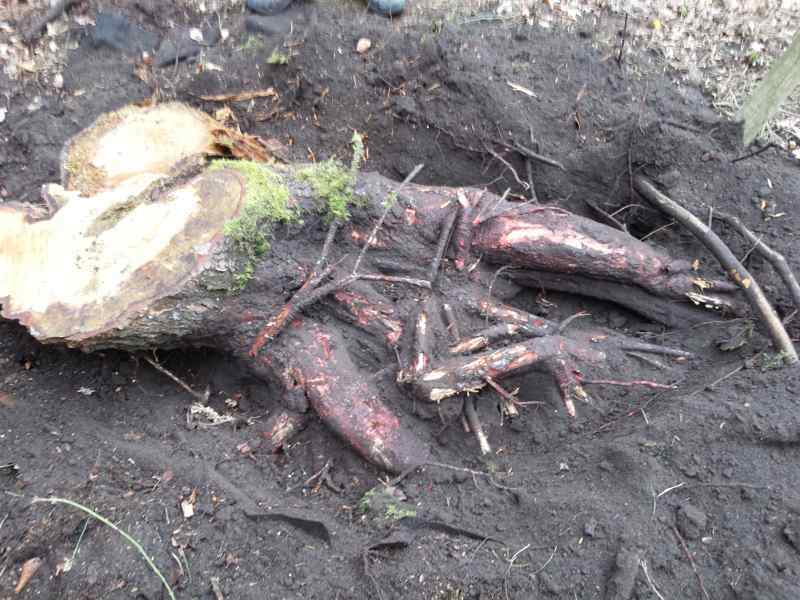 The stump is completely removed whilst leaving the cherry roots intact. After quite a warm day and felling the trees the front garden now looks a lot better. 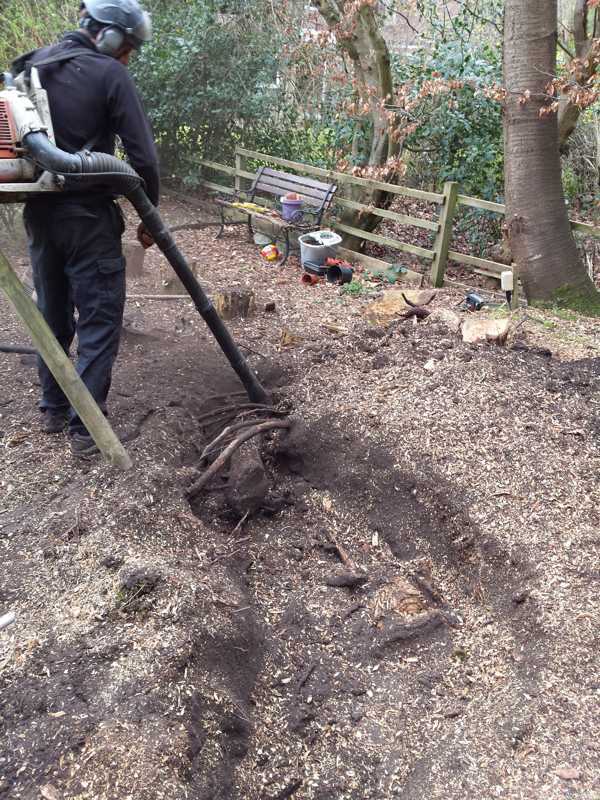 We cleared up and took away all the logs and chipped the rest. Looking much better and the client loved it!